Plant family & botanical details: Brassicaceae. Napa cabbage originated in China, and is more closely related to bok choy than to green cabbage. Store me whole in a plastic bag in the crisper section of your fridge for up to a week! Wash me directly before use. I have a mild taste, and with a neutral palette there are endless options for pairings. I'm great with cilantro, ginger, garlic, scallions, sesame seeds, tofu, vinegar, soy sauce, pork, scallops, and salmon. I am delicious raw, but also am a wonderful ingredient in soup, slaws, and stir fries. I can also be preserved, and am a main ingredient in a kimchi or sauerkraut. I am the most popular cabbage in supermarkets worldwide. I once was considered the patriotic vegetable of China, and am still a mainstay of rural Chinese winter cooking. The largest cabbage dish ever made was on 19 December 2008 in the Macedonian city of Prilep, with 80,191 sarmas (cabbage rolls) weighing 544 kg (1,221 lbs). Harvest season: April if overwintered, otherwise June for outdoor spinach. Greenhouse spinach can be found year round, but sometimes is only available in spurts. Botanical details: Spinach is related to beets, and chard. Great source of*: Vitamin A, Vitamin C, Vitamin K, manganese, and, if that wasn't enough, iron! Keep me loosely wrapped in a paper towel inside a plastic bag, I am best if eaten in 5 days! I have a mild taste, and with a neutral palette there are endless options for pairings. Try matching with fish, lemon and garlic; eggs, mushrooms and cheese; or even ricotta filled ravioli! Try me raw, steamed, sautéed, or baked into a variety of dishes. In the 1930’s spinach growers credited Popeye with a 33% increase in the domestic consumption of spinach. Catherine de' Medici -- who was from Florence, Italy -- was said to love spinach. That's why dishes that are served on a bed of spinach are referred to as "Florentine." California produces 74-percent of the fresh spinach grown in the United States. Two U.S. cities claim to be the ‘spinach capital of the world’: Crystal City, Texas and Alma, Arkansas. Each April in Alma, there’s a spinach festival. 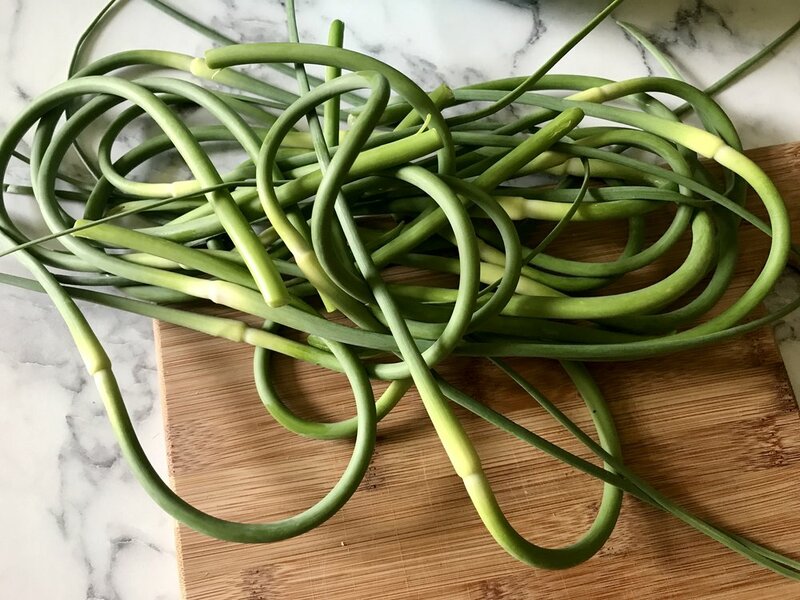 Great source of*: Because garlic scapes are generally eaten in small amounts (as is garlic, generally), one wouldn't normally consider it as a source of nutrients. However, scapes are thought to share the benefits of garlic cloves, including antioxidant properties. Keep me in a plastic bag in the fridge, or, if you're planning to use me quickly, with my stems in a glass of water on the counter (make sure the trim the stem right before putting the scapes in the glass). Scapes are great grilled or sautéed, and pair well with anything that tastes good with garlic cloves, for instance: chicken, beef, eggs, mushrooms, olive oil, and tomatoes. The flavor is a bit milder than that of bulb garlic. The word "garlic" is Anglo-Saxon in origin, and translates as "spear plant." In Ancient Greece, brides carried bouquets of garlic and herbs. In Bram Stoker's Dracula, garlic is mentioned 21 times. The city of Chicago got its name from the word "chicagaoua," a Native American term for the wild garlic that grows near Lake Michigan. The juice from garlic can be used as an adhesive. Botanical details: It takes three years for asparagus to mature enough for commercial harvest. Like flowers! Trim the bottom 1/2-inch of my asparagus stalks, and store me upright in a jar of water, in the fridge. I love butter, whether it's simply melted, mixed with lemon and herbs, or browned. I'm also a great partner for other dairy products, such as heavy cream, chèvre, and ricotta. My tender verdant qualities make me a great match for mushrooms, too. Spruce me up with a squeeze of citrus, and don't forget the freshly grated pepper! The earliest known depiction of asparagus was on an Egyptian frieze that was created around 3,000 B.C. Roman Emperor Caesar Augustus coined the phrase "Velocius quam asparagi coquantur," which translates as "faster than asparagus cooks." Effectively, it means, "get a move on." The Romans had special fleets to transport asparagus, which they prized highly, and carried it into the Alps to freeze it for later. The "scales" at the tip of the asparagus stalk is actually the plant's leaves. In ideal conditions, an asparagus spear can grow 10-inches in one day. In Bavaria, there's an asparagus museum!